My system includes Synergistic Researchs Acoustic ART room-tuning system, PowerCell power conditioner, and several Tesla power cords. At the end of my very positive experiences with these components, Ted Denney of Synergistic Research asked me to add sets of their Tesla Apex charged interconnects and speaker cables to my system. Once Id heard a complete cable system fully shielded from DC current, he said, I wouldnt tolerate anything else. I took him up on his challenge. After wed discussed my system and needs, Denney sent me an 8 pair of Tesla Apex speaker cables ($6500 USD) and two 1m pairs of Apex interconnects ($3600/1m pair). He also sent along a 1m pair of Precision Reference interconnects to connect my line stage to my power amp, as well as a 1m Tesla D3 digital cable. Like the Synergistic Research power cables in my system, the new Tesla Apexes include what Synergistic calls Zero Capacitance Active Shielding circuitry, which puts a direct-current charge on the shield at zero capacitance to prevent interference from external radio and other electromagnetic signals. One thing you have to tolerate with Synergistic Research cables is that you end up with many more wires than you think you will. Because the company believes in charged shielding, each cable has a power charger, and a blue LED that lets you know that everythings hooked up properly. When you turn off your listening-room lights at night, the LEDs blue glow about equals that of a bright full moon -- no need for nightlights. Of course, this was with seven power cords, four sets of interconnects, and a pair of speaker cables. Synergistics entire Tesla line of interconnects and speaker cables combines three technologies -- Tesla Tricon cable geometry, Zero Capacitance Active Shielding, and a conditioning process called Quantum Tunneling (patent pending) -- all purportedly based on the work of Nikola Tesla. Quantum Tunneling involves sending through the cables 2 million volts at a specific pulse modulation ultrahigh frequency for a certain amount of time -- and, obviously, at quite low amperage. This process reportedly derives from Teslas experiments with the Tesla coil. What I found was a radical concept that suggested a cable could be designed that would function as an electromagnetic "lens" to concentrate fluctuating alternating current and its subsequent electromagnetic fields for perfect transfer without distortion or loss of signal. Just as a lens focuses light by concentrating or dispersing rays of light, this new geometry, if it could be developed, would concentrate and focus the sonic signal not by separating conductors, but by strategically aligning conductors in a symmetrical geometry that manages electromagnetic fields as a lens precisely focuses light. Success in developing these ideas led to the Tesla Tricon(ductor) Lens formula. The Tesla series combines this geometry in carefully considered combinations with two older Synergistic Research geometries. These are the Tesla Vortex and the Tesla Acoustic. Understandably, the exact configurations of these geometries are not revealed. Each, however, is a full cable with hot, neutral, and shield, and they are used in different combinations. For example, the Precision Reference interconnect uses just two Tesla Tricons for the fastest transfer rate between the line stage and the amp. The Apex interconnects uses two Tricons and two Acoustics. The Apex cabling uses pure monocrystal silver wire in the special conductor geometries with the Zero Capacitance Active Shielding and the Quantum Tunneling conditioning process. This is true of both the Apex interconnects and speaker cables. I introduced the Tesla Apex cables into my system one at a time, beginning with the speaker cables. I did this to see whether one cable would provide an improvement. I cant say I noticed any such thing, but as I added cables, the quietness of their shielding became increasingly evident, as did their great extension of my systems top and bottom ends. These cables were ruthlessly neutral. I had to adjust the Wave Timing Control, a proprietary circuit in my H-Cat preamp that lets the user focus the soundstage to get the most vivid and precise images. The WTC was at a setting quite different from any Ive used with either my Jade or Townshend reference cables. 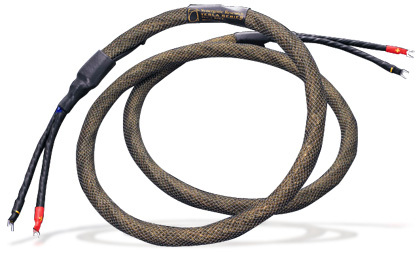 And despite the Active Shielding, the Synergistic cables benefited from isolation from vibrations and static electricity, which I provided with Harmonix A1 cable supports and Rightway Audio Ceramic Suspenders under the speaker cables (but only Suspenders under the interconnects). At first, there was minimal improvement in the cables sound with break-in; after the first three days, I noticed no further changes. However, better than two weeks into my evaluation, there was a substantial and sudden jump in transparency. As is my practice at the Consumer Electronics Show, T.H.E. Show, RMAF, and at home, one of the discs I use to evaluate systems is This Is K2 HD Sound! (CD, First Impression Music FIMK2HD078), fed to my home system from the hard drive of my Exemplar Music Server. In track 1, Rachmaninoffs Symphonic Dances, from Reference Recordings, the orchestra is vividly placed in a panorama before you as it plays several stupendous crescendos. With the Tesla Apex cables installed, the climaxes of these crescendos were thunderous, directional, and quite deep. Also, individual instruments within the orchestra were now quite evident, even when I turned the volume down. The bass was full of energy that hit me viscerally, and the instrument creating these bass notes was more easily located in the soundstage. The individual instruments and vocalists stood in clearly evident locations within the recording venue. The realism was thrilling. Ive heard track 2, a flamenco performance titled Zapateado, sound quite different through different systems. Sometimes it sounds as if the dancer is working on a hollow, poorly constructed floor, sometimes as if hes very heavy, sometimes as if a microphone stand is picking up vibrations from the floor, and sometimes there is no plausible soundstage (although theres usually some sense of the dancers movements at the end of the track). I cant say that the Tesla Apexes totally resolved these differences. The stage sounded quite firm, and there was some sense of feedback through the mike stands. The toe and heel taps were distinct, and the acoustic guitar had great realism. However, I still could not quite resolve the placement of the guitarist and the dancer over my system. Track 5, "Touch," includes lightly struck bells that shimmer, and gongs with nice decay, as well as an enormous drum that virtually explodes. The width and depth of the soundstage, the length of the decay of the bells and gong, and the leading edges of the drumstrokes, all vary greatly among systems. With the Synergistic Research cables in my system, the separation, depth of image, and startling impact were unexcelled by other cables Ive heard. Pachelbels Canon in D, performed by the All Star Percussion Ensemble (track 16), provided excellent tests of ambience, accuracy of wood and bell timbres, and dynamic range. This recording also includes substantial nonmusical details: a thunderstorm, people moving around as the performance continues, and traffic noise outside. The low noise floor provided by the Synergistic cables let me hear these background noises, as well as the subtleties of the instruments being struck and the following decays, better than Id ever heard before. Three other recordings also helped. As I listened to Duke Ellingtons The Great Paris Concert (CD, Atlantic UK B00000213G), particularly "Kinda Dukish" and "Dont Get Around Much Anymore," other cables failed to lend a sense of being there; the Synergistic Research cables were excellent, although the big band in the background still wasnt as dynamic as it would have been had I been present at the concert. In Frank Sinatras melancholy performance of "One for My Baby," on his Only the Lonely (CD, Mobile Fidelity Koch B001BJ65SU), the large orchestra is silent at the start, but after some time it enters, very softly. The intimacy of the arrangement and the blues in Sinatras voice were excellently conveyed through the Tesla Apexes. In comparisons of the Synergistics with my reference Jade Hybrid and Vermeil interconnects and speaker cables and Townshend DCT300 interconnects, several things stood out. First, possibly because of their Active Shielding, the Synergistics were uniquely quiet -- in fact, theyre the quietest cables Ive heard. Second, they were exceptionally fast; the leading edges of horns, bells, and gongs were spot on. Third, their bass was profoundly deep and precise -- an attribute as well of Synergistics power cords and PowerCell. Fourth, their reproduction of high frequencies rang true -- I immediately noticed and rejoiced in that top end. Finally, the soundstages thrown by the Synergistics were strikingly realistic: not only wide and deep and, as some say, layered, but precise as well. The Tesla Apexes are hardly inexpensive. Theyre labor-intensive: each of the three different construction techniques of the component cables is done by hand. 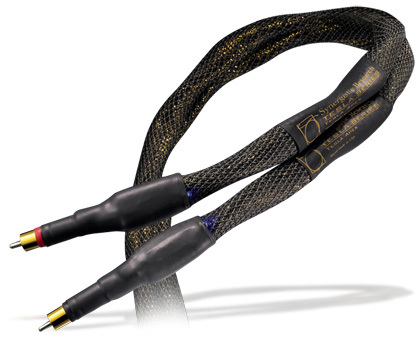 Synergistic Research has been in business now for 20 years, and its considerable investment in the development of new technologies is evident in these cables. Still, the Tesla Apexes cost substantially less than some cables that, to my ears, they outperform. These are the finest interconnects and speaker cables I have heard. Price: $3600 USD per 1m pair. Price: $6500 USD per 8 pair. Warranty: One year; includes lifetime upgrade value against future purchase of other Synergistic Research cables.